Home Posts tagged "Nail art necklace"
Summer party instruction with step by step pictures. We hope that you liked! 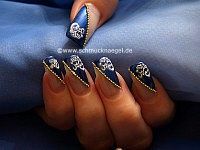 and glitter-powder – French motif with animals step by step. We hope that you liked!